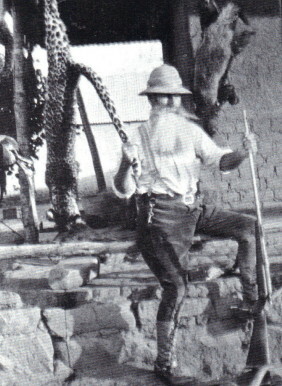 SANDERSON William (Bill) migrated to South Africa from Edinburgh with his brothers Tom and Bob, initially joining the rush when gold was discovered at Lydenburg. They later settled down to farming on a property at ‘Peebles’, situated at the foot of Legogote 10kms North-East of the town of White River . 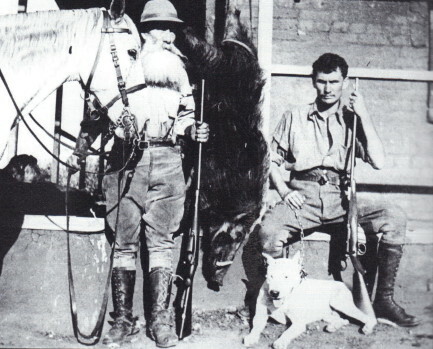 An excellent hunter and a skilled rifleman, Bill Sanderson was described as an eccentric Scottish pioneer of the Transvaal Lowveld. He divided his time between working his farm and hunting in what is today the Kruger National Park. Percy Fitzpatrick used to spend time with Sanderson out in the bush where he learned the finer arts of hunting from Sanderson while his rig was out spanned at Sanderson’s farm. A cairn depicting the original Jock Trek Route still stands in the garden of the old Sanderson homestead. The three brothers and their Boer neighbours enjoyed a friendly relationship and they were also burghers of the South African Republic and thus liable for service with the local commando in times of strife. It appears that Tom may have died before 1899. Game and other skins were tanned near Logie’s Kop, where a certain Logie had a lodge. Logie, who farmed at the foot on the south-western side of Legogote, erected a lodge and made cattle enclosures of stone, where transport riders used to stop over. It eventually became known as Logies Lodge and the western, and the smaller ridge of the mountain, situated on Logies farm, where the lodge was built, became known as Logies Kop, as it is still known today. The enclosures where the transport riders kept their cattle at night are still in evidence. 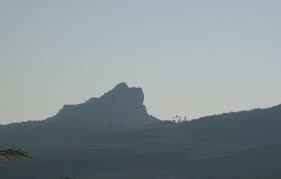 The emaMbayi named the hill, where the tanning took place eLegogoto, meaning the ‘place of the skins’. Some people say that ‘Lugogo’ is the original root of the word Legogote which means ‘skin’ of an animal. Wild animals are known as ‘magogo’. Today this hill is known as ‘Ligogothe’ by the local black people. During the transport era (1875-1890), transport riders had the skins of animals, which they shot along the way, tanned by the emaMbayi. These skins were then used as thongs in place of trek chains for the wagons which were apparently difficult to access. emaMBayi decendants still live in the vicinity to this day. Paul Dell who is well acquainted with the whole Legogote region, grew up on Sanderson’s farm and lived in the homestead. 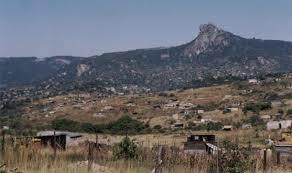 He knows the local dialects very well too and says that the name is derived from the sound of sentry drums being played on the slopes of Legogote from the caves to warn the locals of impending raids from the militant Swazis. Paul says that the repeated rhythm of the drums sounded like Gogote! Gogote! which eventually became Legogote. Harry Wolhuter in his book “Memories of a Game-Ranger” maintains something else. He says that the name Legogote is the name of the ‘klipspringer’ antelope that frequent the rocky slopes of the mountain. 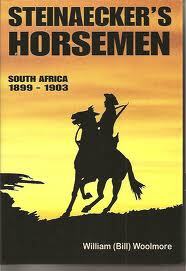 When the Anglo-Boer War broke out in October 1899 Bill and Bob found themselves in a serious predicament. They were not prepared to take up arms as burghers of the Republic against their own countrymen, the British, but fortunately their local Veld-kornet, Abel Erasmus, understood and left them on their farm. Bob decided to clear out and went over the border into Portuguese East Africa for the duration of the conflict. He later died in Barberton. Bill Sanderson remained and worked the farm at Legogote. Word reached Steinaecker at Komati Poort that a British farmer was being detained by the Boers near White River against his will and he was requested to ‘liberate’ him. He got a message to Sanderson advising him that a patrol would be sent to ‘rescue’ him, but this was not what Sanderson wanted and he replied that he had friends on both sides and wished to stay neutral. Steinaecker became suspicious and then instructed that a patrol take Bill Sanderson into custody as a traitor. As the patrol took him away they were fired on by Boers who then commandeered Sanderson’s farm and stock thinking he had now joined the British forces. The Scot was detained under guard, by a detachment of Steinaecker’s Horse commanded by Lieutenant ‘Gaza’ Gray, at an old store belonging to Sardelli, a Greek, on the Lebombo range near Sabie Poort. Steinaecker relieved Sanderson of his best horse and his guns. He was later allowed to return to his farm where he discovered that the Boers had removed all his possessions and had stripped his property bare. He was forced to start out afresh. It was the habit of some of the early settlers to take paramours from amongst the locals. There are many Coloured folk who are the offspring of these liaisons in the district with the surname Sanderson as well as other names. Over the years they have served the community with distinction. According to Paul Dell whose family were good friends with Bill Sanderson, Sanderson did not indulge in the practice of cohabiting with paramours. Apparently there was an aristocratic person of means who used to visit Bill Sanderson who took a particular liking to paramours. Their descendants have spread throughout. It seems as if their offspring took the name of Sanderson as a reference to where the aristocrat resided. Gleaned from “Steinaecker’s Horsemen” by Bill Woolmore and other sources. Call our Dream Merchants at TRIPS ZA for exciting History, Wildlife, Scenic, and general Interest tours in the Panorama, Kruger, Lowveld regions or beyond on 013 764 1177. This entry was posted in Biography, History. Bookmark the permalink. William Sanderson, kenneth sanderson,Stella Sanderson. Were all siblings in White River but their father had a farm in Louis Trichard. What are they related to Bill or Tom Sanderson? There is more to the Sanderson family saga than is generally published. I would like us to correspond directly by email as regards this situation, if that is OK by you ? I refer you to the “The Kruger National Park a History” by Dr. Salmon Joubert. I have no further knowledge of the Sanderson homestead apart from the fact that Bill Sanderson built it originally. It was altered significantly over years but still stands & is occupied as a home today.